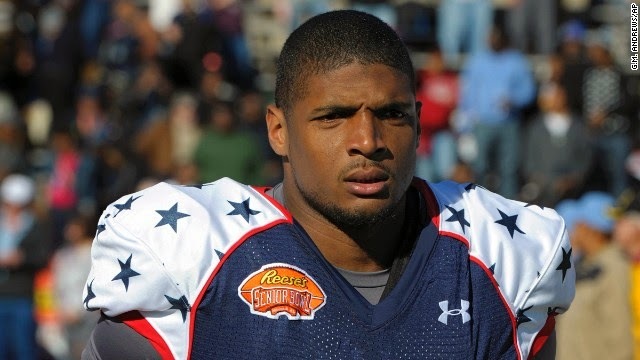 When the news broke on Sunday night that Missouri DE Michael Sam had publicly acknowledged that he was gay - likely making him the first out active major sport athlete - I was riding in a rented van with a group of my teammates on our way home from a pond hockey tournament in Maine. When I saw the news I immediately shared it with my teammates without giving it a second thought. I didn't worry about what they would think about it because I already knew first hand that they would be cool with an out teammate. In that moment I was reminded about how powerful being out in sports can be - even to lowly rec leaguers like me and it has inspired me to re-post this piece I wrote for Pens Initiative after NBA-er Jason Collins came out. Some of you out there may not think that moments like this matter, may not understand why they matter, or may not be able to comprehend how importat they are to some of us - but trust me when I tell you it matters. So I didn’t start out planning to write about Jason Collins this week for Pens Initiative. I had planned on writing on Ray Shero, but sometimes things happen in the world and intervene – and this week, for me, Jason Collins is what happened. My Ray Shero post can wait, this one cannot. I admit that I care very little about the NBA. As far as the big 4 sports go, it is firmly in the 4 spot in my house. But today, I am a huge Jason Collins fan. By announcing that he was gay, Collins became the first male athlete currently playing in any of the big 4 sports to be openly gay. Others have come out, but it has always been after their playing careers ended. Most of the reaction to Collins announcement has been positive, some has been negative, and some have wondered why it even matters. To those who have reacted supportively – thank you. To those who wonder why it even matters, let me tell you why it matters. As a 39 year old sports nut, who happens to be gay, this Collins announcement matters more than some may ever know. I have always loved sports, sports has been a unifier in my family. Growing up my dad and I didn’t always see eye to eye, and often I felt like we had very little in common – but we always had sports. I often struggled to find things to talk to my dad about, and I know he struggled to find things to talk to me about, but bring up sports and we could talk for hours. Growing up and knowing you are gay – something I knew but didn’t admit to the world from the time I was very young – brings with it an immediate feeling of being an outsider. Of feeling like you didn’t belong, that you couldn’t belong, because you were different. Sports and being a fan of sports made me feel like I belonged to something. Sports are the great unifier. As Pens fans we aren’t black or white or male or female or rich or poor we are just Pens fans. It’s like a giant family. But I still felt like the outsider – even when it came to sports. There were no out gay sports figures, no one helping to smash the ridiculous stereotype of what gay people are like. The message that sent to gay sports fans everywhere was that we were still the outsiders. That we still didn’t belong. All that changed yesterday. It doesn’t matter that Jason Collins is a journeyman center at the end of his career, what matters is that he was first. Hearing so much support for Collins from sports reporters, from other pro players, and from other fans made me – and I suspect many gay sports fans – feel less like outsiders and more like a welcome part of the sports family. Collins announcement didn’t just have an impact on gay sports fans; it obviously had one on gay players. Jason Collins’ announcement will make the next guys decision to be open and honest with his teammates and the fans infinitely easier. This year, at 39, I decided to play rec league hockey. As someone who loves hockey, I thought it was time I laced up the skates and gave it a shot while I was still young enough (relatively) to do it. I joined a team with 20 other folks, who I didn’t know and who didn’t know me. Like any team we sit around the locker room after practices and games and talk – about our lives, our families, etc. The first time I mentioned my partner Shawn, I felt awkward. Even as a 39 year old, who has been out since I was 21, I was nervous to tell my teammates that I was gay. I can’t imagine how Jason Collins must have felt. But thanks to Jason Collins, it will be easier for the next guy who tells his teammates the truth about who he is – and it will be easier for all gay athletes to be open and honest from rec leagues to major leagues. The NHL has been on the leading edge of acceptance of gay athletes and gay fans. The "You Can Play Project" has been a ground-breaking effort. I have no doubt that one day soon, the NHL will have an openly gay player - and I have no doubt that NHL owners, players and fans will embrace that moment. I get that for many straight sports fans the Jason Collins announcement may have seemed like much to do about nothing. But for me, and for many other gay people, the announcement was an historic moment. I can't wait for the day that someone's sexual orientation is completely irrelevant in sports, until the day that someone announcing they were gay really is a non-story.